I’m sure the contractors will return but for the moment they are gone. And oh, look what a mess they left in what used to be a pretty front garden. As I have mentioned before, I bought a stone tent: spalling crépi, dodgy wiring and plumbing, no insulation but plenty of mildew. Folks had died in all the bedrooms and down in the dining room, too, though probably not from the food. The house was sad and in need of rescue. The garden looked to be in better shape. Then it turned out that it wasn’t. As the family ran out of money, they cut corners on maintenance. Improper pruning caused three stunning chestnuts to rot, to the point that they were soon going to fall right over. They had to go. Other trees had not been pruned at all. Bulbs were in desperate need of division. Rose bushes had become spindly. Three years of contractor parking and general abuse basically finished the place off. This is the first week I have really had the place to myself. I did some shifting of stuff inside. Then it dawned on me; it was finally safe to do a little gardening. I have a beautiful garden plan with no money to implement it. I have more weeds than plants worth keeping. Until the finances recover, I have one real option: garden triage. So this is what I am doing. I tackle one little thing at a time. I do that and I don’t worry about what is not done. There is no point. Here I have a planter with thyme that survived the winter. So I added a little more thyme and added a few pelargoniums. I’m hoping the pelargoniums are tough, too, and don’t need a whole lot of water. I am wildly grateful for anything that survives my style of gardening. Back when I lived in Los Angeles I would search the Western Garden Book for anything that was said to be both invasive and drought-tolerant. Those were my plants. 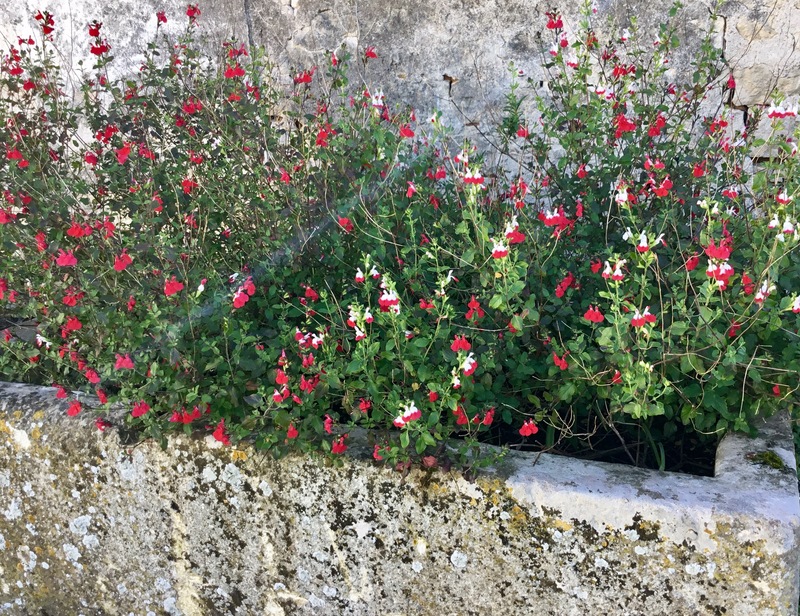 This salvia is one of them and I am glad to have found it here in France. It has gone almost a year with no water, pouring rain, light frost, heat waves and near-constant shade, when it should be in full sun. It is not only alive, it’s in bloom. I love this stuff. Back in December I thought the contractors would leave in a month or so. The city wants to sell me a strip of land and said they would expedite the escrow; I’d have the property by the end of the year. I believed them. Silly me. So here I am with trees and rose bushes that have intended homes and there is nothing I can do about it. Julien rigged up a temporary planter and we’re hoping they make it until the next bare root season. 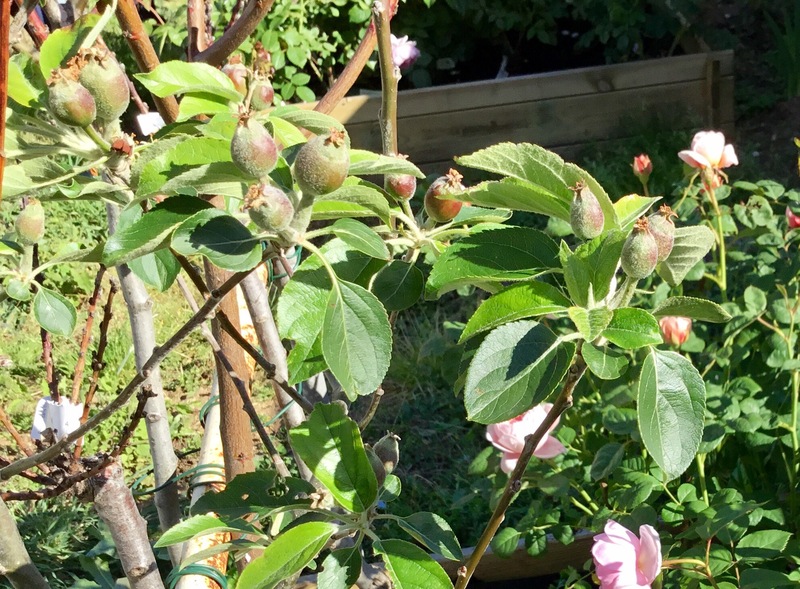 Most of the trees look a little dubious but this apple, Reine de Reinette, is actually setting fruit. I can’t wait to taste it. The city approached me about buying that land because it is an attractive nuisance, a partly hidden area where kids like to party. They asked me to put in a wall. I thought yeah, and maybe a barrier hedge, too. So, David Austin to the rescue. 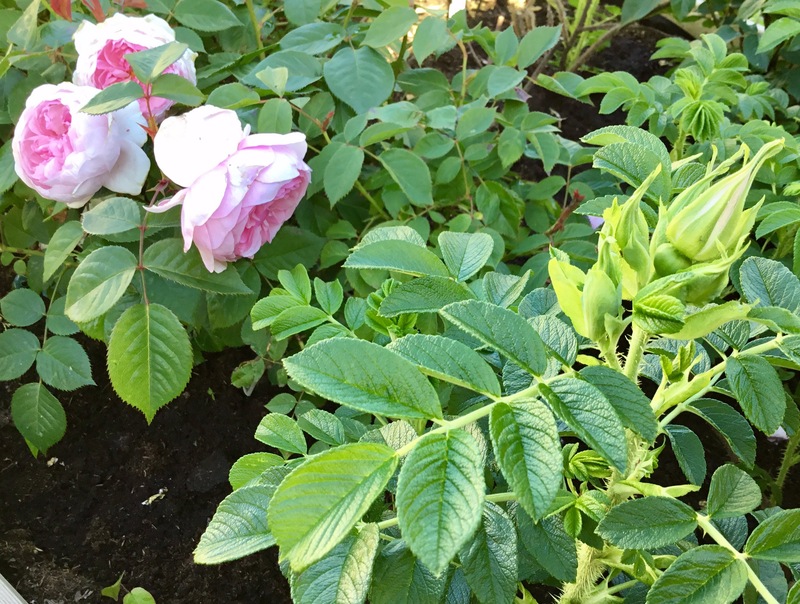 The rose on the right is a rugosa, notoriously tough and just look that those thorns. That is a serious barrier. The one on the left is called Queen of Sweden and is earmarked for the planter along the front of the house. Of course I pay close attention to anything that survived all this abuse and neglect. 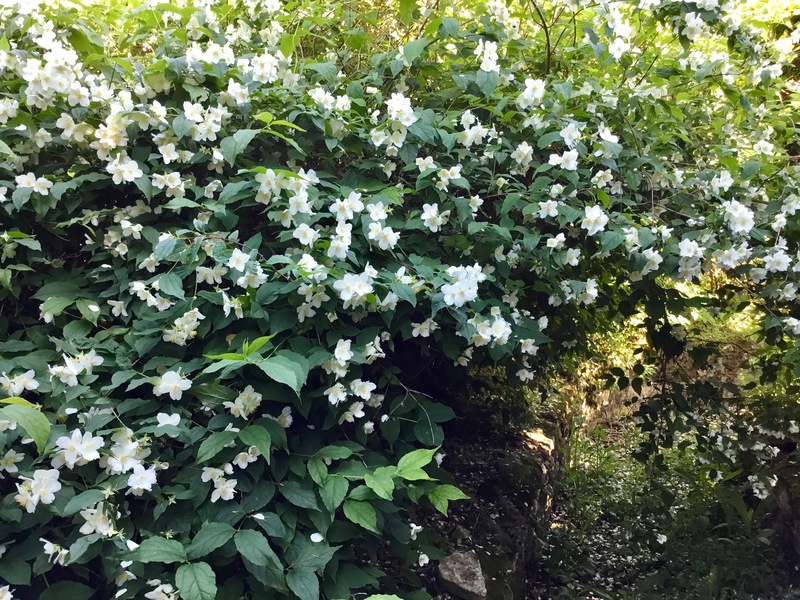 This bush not only grows with no encouragement whatsoever, it flowers for a month or two and is taking over its corner of the garden. May it live long and prosper. My favorite discovery of this whole process is that deadheading roses is a meditative experience. If you can protect your knees, weeding is, too. I could learn to like gardening. Faced as I am with an acre of weeds, that’s good. Dealing with a local council you can do with a few meditative experiences…of the dead heading kind. Too true! Six months and counting, Helen, to close escrow on a tiny little strip of land. And they initiated the sale! It’s amazing. As long as you’re not out there thinking,”One weed down, ten million to go,” getting yourself all worked up, you get into the present moment, just like your choice of teacher says to, and the stress just rolls off. Renovating that garden is going to be a big job, much of it more than can be done without sending in the heavy equipment to scrape off the top layer and replace it all with topsoil. Unfortunately that’s out there. For now, until I scrape together the pennies to do that, it’s one weed at a time an more calming than I would ever have imagined. Determined, yes. Knowledgeable, not so much. I love the garden but I am only beginning to appreciate what Vita Sackville-West, Christopher Lloyd and the rest managed to accomplish. We’ll see how it goes. I am fortunate to have at least one good adviser. That would be Rebecca Heard. She’s terrific, plus she’s far away and charges for her advice — which is to say, she keeps it to the essentials. My kind of adviser. Mine is Roddy Llewellyn http://www.roddyllewellyn.co.uk/ but he is a very old friend so he isn’t allowed to charge – some gateaux have a cerise in my life. Keeping it simple and paired down be it seeking advice or what I am wearing is very much my modus operandi! They left my ‘garden’ in a similar state, without the advantage of existing plants & bulbs! 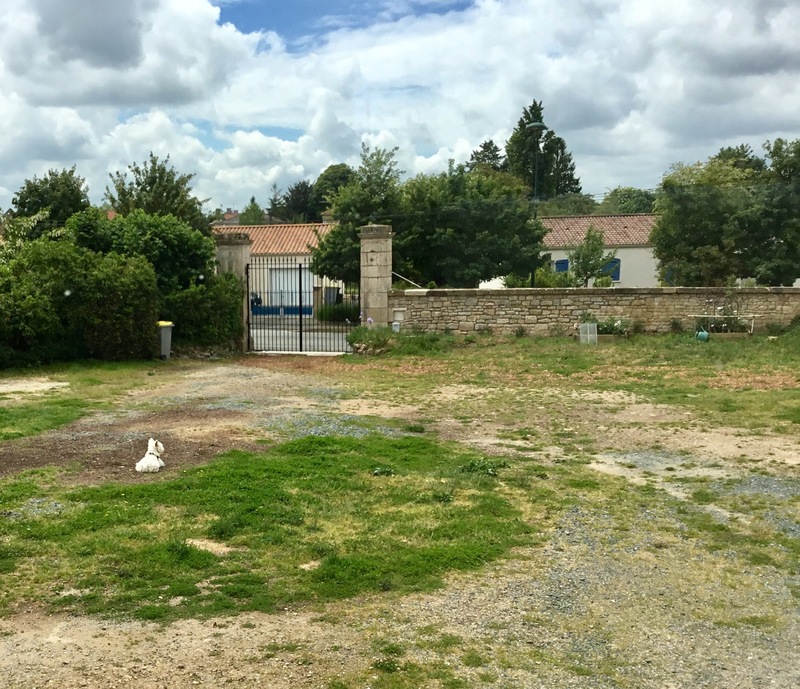 (it’s a barn renovation so was in the middle of a meadow) Sadly no funds left to create a garden – just a green-fingered husband with big dreams……..
Really, if you can mow that meadow, it can look pretty good to the casual observer. Throw some gravel over the parts where you drive, add some actual flowers around the entry and you can fool people into thinking things are fine. It’s the gardening equivalent of “cleaning” for a party by throwing all the clutter into the closets and the garage. I have been wondering what direction to take the blog in. Maybe I should become the “anti-Monty Don.” He’s a nice-looking, big strong guy with a pristine Golden Retriever, handling major chores without breaking a sweat. I can be the fat old lady with a dirty terrier who sticks his nose right to the bottom of every little hole before he’ll let me plant something in it. He does seasonal maintenance in a garden that already looks perfect. I can do a “disaster of the week,” featuring one of those concrete piles, say, or the stumps that were left when the trees were cut down. It would be pretty funny until it got old. After our first – and only – encounter with French builders I discovered the term ´cadeau empoisonne´ for the little surprises hidden in the shrubbery: the lumps of concrete from the mixes made and not used before they messed off for lunch then chiselled out of the wheelbarrow in the afternoon and dumped where they would not be seen…. That must have been a kinder, gentler era. My guys just looked at the mess and said oh well, and left it. The more I look, the more I find. No wonder the garden has all these bald patches. Good luck. May the roses prosper and create a beautiful defense. Kind of like Sleeping Beauty! Thank you. I did something like that in San Francisco. I bought an upper flat in a part of the Mission that is likely still not gentrified. The nicest neighbors were the guys across the street, the ones who ran the chop shop. It was the last place in San Francisco that I could afford; I was not outbid only because nobody really wanted to pay serious money for a place surrounded by drug dealers and a pretty rough housing project. Anyway, as a mental defense, if nothing else, against the street noise, I had made these beautiful slubbed silk window shades and popped for a milk-based paint to match. Together they softened the edges and even damped the sound, I think. When I was a kid I was allergic to appearances because I didn’t like what I saw behind them. Now that I’m the adult and have been able to assure that the “hidden” stuff is honest and good — at least in my own life — I’m getting back into appearances. So yes, until the big renovation money rolls in, let’s plant some roses. They hide nothing but they make what is there much nicer. It’s not just plants for sale, although there are suppliers from all over France – one guy is a lavender specialist and has at least 20 different varieties. That sounds great. I think I might be back in time to go to that. Thank you! And yes, the trick is to have a master plan, fitting things into it as time and money allow. Meantime I am definitely looking forward to that event. All I need is a jackhammer to get through the concrete-quality soil, that and the actual concrete the guys left around. I’m sure you’ll be hearing lots of groaning about this garden. One “softening” strategy seems to be to lay down mulch. It encourages the weeds but the weeds break up the soil. So I will prevail. It will just take a little time. Your garden, like your house, has beautiful bones and will be gorgeous.